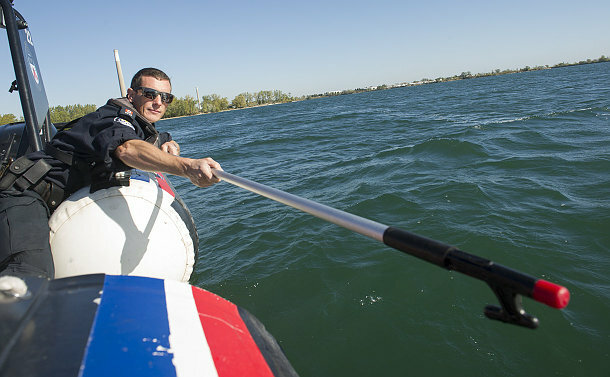 Constable Jeffrey Lucifora has rescued many adventurers that run into difficulty in Lake Ontario. None, however, came as close to losing their lives with the seven-year Marine veteran on duty as the young man who fell out of a canoe on October 16. Just after 2:20 p.m. a 9-1-1 call was made alerting police to the man who tried swimming to shore after falling from the boat. 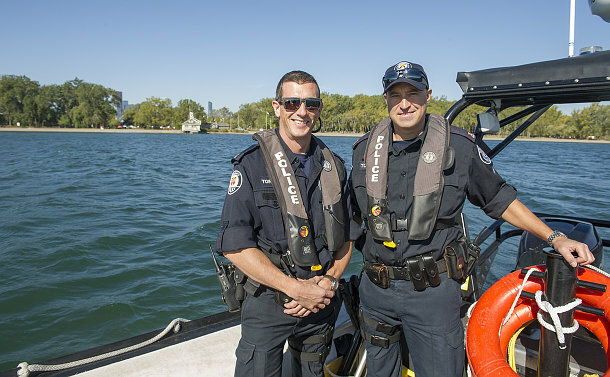 “We were at the front desk when I answered the phone, the Communication Operator was on the line patching me through to a female complainant who told me someone was in the water off Cherry Beach south of the main lifeguard stand… I asked if he was wearing a life jacket and she confirmed he wasn’t” said Constable Jason Keegan. 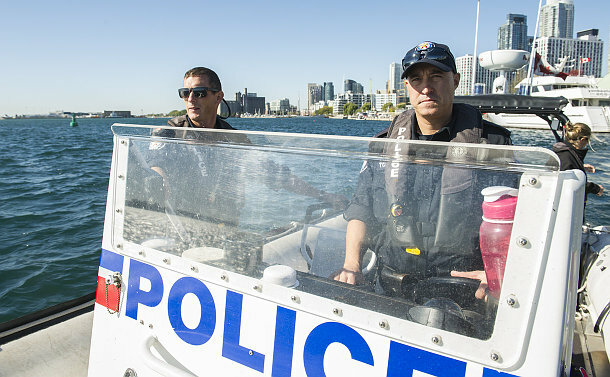 Lucifora, Keegan headed for a boat with Paramedic Andrew Pirrie, opting for a zodiac powered by twin 300 horsepower engines – the fastest in the fleet and were on plane as soon as they hit the mouth of Toronto Harbour from their docks. It took about four minutes in a straight line to get eyes on the capsized canoe. The canoe was about 450 metres from shore, the man was halfway to shore at Cherry Beach. “We saw him thrashing in the water,” Keegan said. They moved quickly toward him, Lucifora blasting the horn once they were within 100 feet to let the man know that help was arriving and to keep fighting to stay atop the water line. They threw a ring to the man as they closed the gap but he was unable to retrieve it. He had ingested a lot of water and was throwing up and shaking uncontrollably as Pirrie worked on him. The paramedic cut the man’s sweater off and covered him up in a blanket, checked his vitals and tried to keep the man alert and responsive as they headed to the Cherry St. terminal to meet an ambulance already at the shoreline. The victim was able to communicate with the paramedic and was quick to thank his rescuers in spite of his distress. There is a paramedic attached to the Marine Unit 24-7. “Having a medic there is essential for us and ensures we get immediate medical attention to that victim,” Lucifora said, noting that seconds count in these water rescues. He said in this case, the man would have died if they had arrived on the scene even 10 seconds later. The man had been returning to shore when he capsized. He had been the star of a music video that friends on the shore had been filming with a drone. Lucifora is advising anyone venturing into the lake to take safety precautions and prepare for the worst case scenario. Lucifora said it is a busy time of year for the Marine Unit. “There is a potential for serious calls to increase this time of year because of colder, rougher and windier conditions and there are less boats on the water to help people out when they are in distress,” he said. Even experienced boaters can get into trouble on the water. The officers had responded to a call on Sunday when a man in a powerboat couldn’t restart his engine after trying to bring it in to harbour for storage in rough water. Thankfully the man was able to jump off the boat at shore with the help of officers but they couldn’t save the boat from the rocky shoreline.